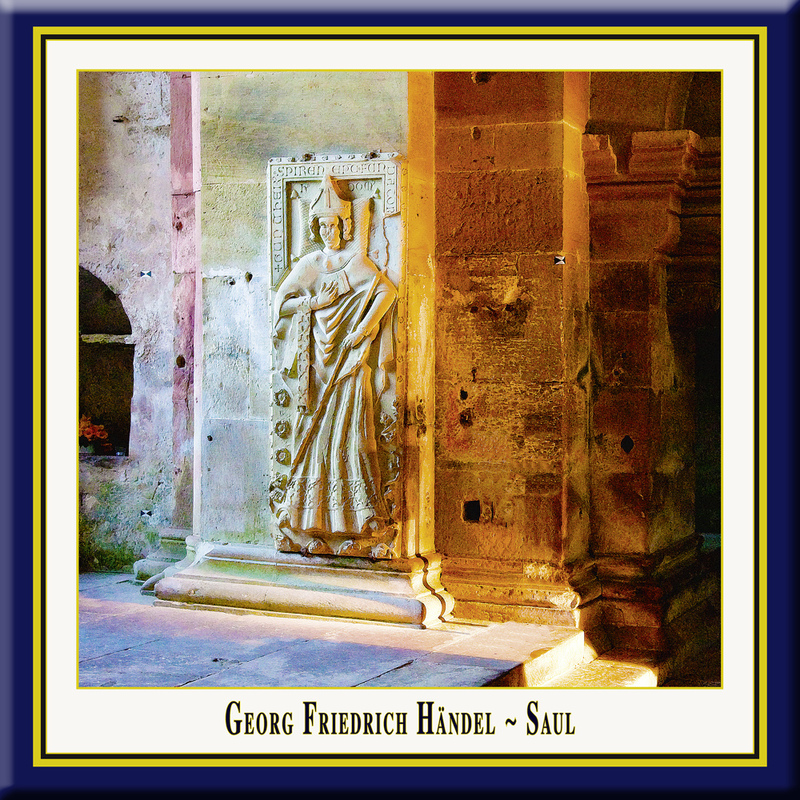 n July 1738 Handel began to compose the monumental and heroic story of Saul. The libretto had been put together by Charles Jennens, a very wealthy literary dilettante with many pretensions, but some talent. He played to Handel's strengths, and gave the composer many dramatic opportunities in the libretto. Handel had a difficult time finishing this oratorio, interrupting it to compose the opera Imeneo. The story of David and Saul has always been a popular one, and on the English stage it is represented by a magnificent operatic scena by Henry Purcell. The tragedy of Saul is stark, and concerns his derangement, his moral failings, and his heroism. The drama is given a spiritual and magical element with the Witch of Endor and the ghost of Samuel as intermediaries into the next world. The dramatic chorus, again used as a chorus might be used in a classic Greek tragedy, moves the drama along, creates the moods, and influences the action. It is a chorus of Saul's people, who are heavily involved in his fate, and in the results of his actions. Handel composed for bass voice, tenor, and countertenor, and refrained from introducing into the score a virtuosic castrato as was common in his day. The somberness of the story required natural male voices whose depth adds to the gravity and weight of the outcome. 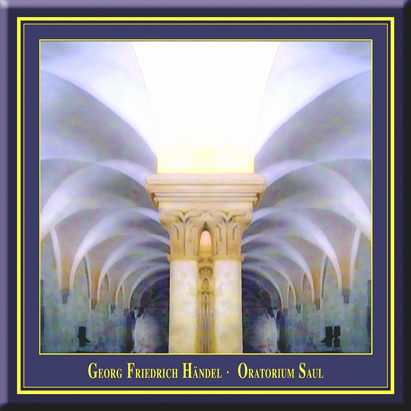 The tragedy of Saul is filled with high drama, and although the chorus again proves the flexibility of the oratorio form, the characterizations and solo music are filled with passion, and vigor. The first part opens with the first scene in the Israelitish camp, where the people join in a song of Triumph over Goliath and the Philistines. It is made up of a chorus ("How excellent Thy Name, O Lord! "), which is a stirring tribute of praise; an aria ("An Infant raised by Thy Command"), describing the meeting of David and Goliath; a trio, in which the giant is pictured as the "monster atheist," striding along to the vigorous and expressive music; and three closing choruses ("The Youth inspired by Thee"), ("How excellent Thy Name"), and a jubilant ("Hallelujah"), ending in plain but massive harmony. The second scene is in Saul's tent. Two bars of recitative prelude an aria by Michal, Saul's daughter, who reveals her love for David ("O god-like Youth!"). Abner presents David to Saul, and a dialogue ensues between them, in which the conqueror announces his origin, and Saul pleads with him to remain, offering the hand of his daughter Merab as an inducement. David, whose part is sung by a contralto, replies in a beautiful aria, in which he attributes his success to the help of the Lord alone. In the next four numbers the friendship of Jonathan and David is cemented, which is followed by a three-verse hymn ("While yet Thy Tide of Blood runs high") of a stately character, sung by the High Priest. In a few bars of recitative Saul betroths his daughter Merab to David; but the girl replies in a vigorous aria ("My Soul rejects the Thought with Scorn"), in which she declares her intention of frustrating the scheme to unite a plebeian with the royal line. It is followed by a plaintive but vigorous aria ("See with what a scornful Air"), sung by Michal, who again gives expression to her love for David. The next scene is entitled "Before an Israelitish City," and is prefaced with a short symphony of a jubilant character. A brief recitative introduces the maidens of the land singing and dancing in praise of the victor, leading up to one of Handel's finest choruses ("Welcome, welcome, mighty King") -- a fresh, a vigorous semi-chorus accompanied by the carillons, in which Saul's jealousy is aroused by the superiority of prowess attributed to David. It is followed by a furious aria ("With Rage I shall burst, his Praises to hear"). Jonathan laments the imprudence of the women in making comparisons, and Michal suggests to David that it is an old malady which may be assuaged by music, and in an aria ("Fell Rage and black Despair") expresses her belief that the monarch can be cured by David's persuasive lyre." The next scene is in the King's house. David sings an aria ("O Lord whose Mercies numberless"), followed by a harp solo; but in vain. Jonathan is in despair, and Saul, in an aria ("A Serpent in my Bosom warmed"), gives vent to his fury and hurls his javelin at David. The latter escapes; and in furious recitative Saul charges his son to destroy him. The next number is an aria of Merab ("Capricious Man, in Humor lost"), lamenting Saul's temper; and Jonathan follows with a dramatic recitative and aria, in which he refuses to obey his father's behest. The High Priest appeals to Heaven ("O Lord, whose Providence") to protect David, and the first part closes with a powerful chorus ("Preserve him for the Glory of Thy Name"). The second part is laid in the place, and opens with a powerfully descriptive chorus ("Envy, eldest-born of Hell!"). In the noble song ("But sooner Jordan's Stream, I swear") Jonathan assures David he will never injure him. In a colloquy between them David is informed that Saul has bestowed the hand of the haughty Merab on Adriel, and Jonathan pleads the cause of the lovely Michal. Saul approaches, and David retires. Saul inquires of Jonathan whether he has obeyed his commands, and in a simple sweet, and flowing melody ("Sin not, O King, against the Youth") he seems to overcome the wrath of the monarch, who dissembles and welcomes David, bidding him to repel to the insults of the Philistines, and offering him his daughter Michal as a proof of his sincerity. In the second scene Michal declares her love for David, and they join in a raptorous duet ("O fairest of ten thousand fair"), which is followed by a chorus in simple harmony ("Is there a Man who all his Ways"). A long symphony follows, preparing the way for the attempt on David's Life. After an agitated duet with Michal ("At Persecution I can laugh"), David makes his escape just as Doeg, the messenger, enters with instructions to bring David to the King's chamber. He is shown the image in David's bed, which he says will only enrage the King still more. Michal sings an exultant aria ("No, let the Guilty tremble"), and even Merab, won over by David's qualities, pleads for him in a beautiful aria ("Author of Peace"). Another symphony intervenes, preluding the celebration of the feast of the new moon in the place, to which David has been invited. Jonathan again interposes with an effort to save David's life, whereupon Saul, in a fresh outburst of indignation, hurls his javelin at his son, and the chorus bursts out in horror ("Oh, fatal Consequence of Rage!"). The third part opens with the intensely dramatic scene with the Witch of Endor, the interview being preluded by the powerful recitative ("Wretch that I am!"). The second scene is laid in the Witch's abode, where the incantation is practised that brings up the apparition of Samuel. This scene closes with an elegy foreboding the coming tragedy. The third scene opens with the interview between David and the Amalekite who brings the tidings of the death of Saul and Jonathan. It is followed by that magnificent dirge, the "Dead March," whose simply yet solemn and majestic strains are familiar to every one. The trumpets and trombones with their sonorous pomp and the wailing oboes and clarinets make an instrumental pageant which is the very apotheosis of grief. The effect of the march is all the more remarkable when it is considered that, in contradistinction to all other dirges, it is written in the major key. The chorus ("Mourn, Israel, mourn thy Beauty lost"), and the three arias of lament sung by David, which follow, are all characterized by feelings of the deepest gloom. A short chorus ("Eagles were not so swift as they") follows, and then David gives voice to his lament over Jonathan in an aria of exquisite tenderness ("In sweetest Harmony they lived"), at the close of which he joins with the chorus in an obligato of sorrowful grandeur ("Oh, fatal Day, how long the Mighty Lie!"). In an exultant strain Abner bids the "men of Judah weep no more," and the animated martial chorus ("Gird on thy Sword, thou Man of Might") closes this great dramatic oratorio.